To be completely honest, I’m not a full-blooded vegetarian. Every now and then, there is a recipe that brings me back to the omnivore side of the dinner table for a few bites when ethically farmed grass-fed meat is served and this is one of them. I stumbled upon this very accidentally on a day when I had zero desire to cook and every desire to do absolutely nothing productive all day long. I wasn’t feeling particularly creative that day but I had this brisket from my farm share that I HAD to make. What in a proverbial hot place do I do with a brisket? The day was just not looking good for me. I had a brisket that I had no idea what to do with, a bottle of Pinot Noir that I had no idea what to do with, and some PHENOMENAL honey that I wanted to put on everything I ate. (I got it from a 12-year-old beekeeper at a farmer’s market. The girl may only be 12 but she makes the best honey I’ve ever had.) Garlic and onion go with everything and I had more sage than I had anything else. I dumped it all in my slow cooker and hoped for the best. Sometimes, these things just work themselves out. This was that day. Unfortunately, I didn’t have any pinor noir left by the time dinner rolled around because I accidentally drank it all while watching movies with The Cop all afternoon. I was happy stealing nips here and there on movie breaks but the next thing I knew there weren’t many nips left, and I was slovenly sprawled out on the couch watching Despicable Me (for what had to be the 32nd time in two months) and alternating between my “serious” Eastern European accent and squealing how much I wanted my very own minion. It was a banner day. * Do not add salt if your beef broth already contains salt! ** You can also substitute one small or medium yellow onion. For notes on serving suggestions, portion size, and tips on using a slow cooker, please see the end of the article HERE. 1. If necessary, trim fat off of the brisket. I did not trim the brisket shown here because the minimal amount of fat was not worth the time for me to trim it. It is important to note that grass-fed beef has MUCH LESS fat that industrial corn-fed feedlot beef purchased at the traditional grocery store. 2. If necessary, cut the brisket across the grain to make it fit into your slow cooker. freshly ground pepper and salt if your beef stock does not contain salt. 4. Add sage, garlic, and onions. 5. Add the beef stock and the Pinot Noir. I prefer to make my own beef stock; however if you purchase it, choose carefully. When I purchase stock, I do not purchase stock in a can because I can taste the can and that just has me obsessing over the taste of a can instead of dinner. I go with one in a box for better flavor. If you choose to use processed beef bouillon, skip the bouillon cubes and choose a paste for better flavor. The wine you choose depends on your personal taste. If you have a brand you like, go for it! 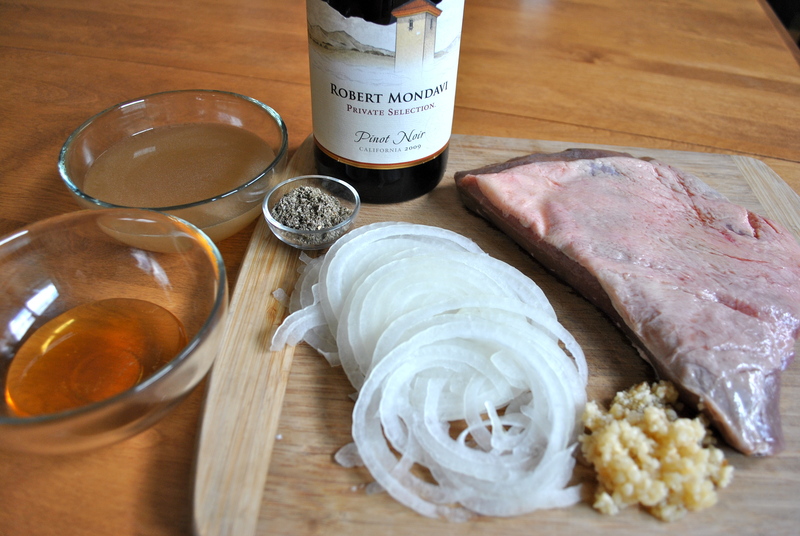 I happen to like Robert Mondavi and his is my go to label of choice; however, I do not cook with his regular wine. Do what you will, but I personally do not put my good drinking wine in the pot to cook all day. Instead I turn to Robert Mondavi Private Label which is his mid-grade offering at about $10 per bottle. Private Label also makes a suitable, budget conscious drinking wine. For an even less expensive option but great flavor, I find Woodbridge by Robert Mondavi acceptable for cooking at about $7 per bottle. 6. Cover and cook on low for 8 hours. Remove brisket and rest on cutting board for a few minutes. If you let the brisket cool just slightly it is easier to cut. Cut across the grain of the meat, holding the knife at a 45 degree angle. Always remember to cut away from you. 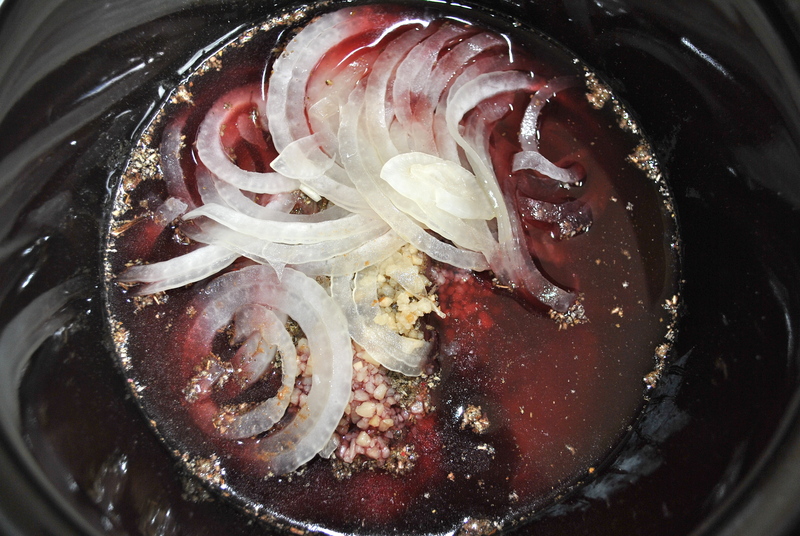 To present meat, spoon sauce from slow cooker onto meat, drizzle with honey and top with onions from the slow cooker. Drizzle with a very small amount of sour cream, if desired. I typically pair this with a mixed lettuce salad, paprika roasted potatoes, and asparagus, garlic green beans, or grilled zucchini depending on the season to make a meal. It should come as no surprise that I serve it with Pinot Noir wine unless I accidentally drank it. The size of a brisket varies greatly in size from 2 pounds and up. We do not eat a large amount of meat in any one setting, so I cut brisket into 1 pound portions and freeze them. Since our family only eats very little beef per serving, 1 pound of brisket as shown here yields 8 servings for us. This brisket would yield 4 servings of the traditional 4 ounce beef serving recommendation. If you would are planning on cooking a larger brisket, adjust the ingredients as follows: for a two pound brisket use 4 teaspoons dried sage, 4 cloves garlic, ½ to ¾ onion, 1½ cup each of beef stock and Pinot Noir, and 3 tablespoons honey. If you are adding salt, increase salt to ½ teaspoon. For a brisket larger than two pounds, take a wild guess and have fun with it! • Removing the lid of your slow cooker will extend your cooking time each time!! • For maximum cooking efficiency, only fill the cooker ½ to ¾ full. • Cooking times vary with each slow cooker so adjust cooking time for your device. 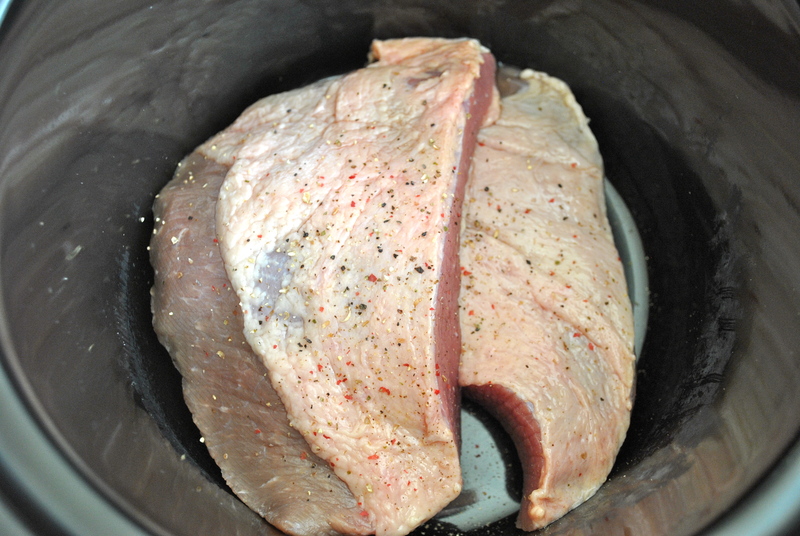 • For food safety, always thaw meat completely before adding it to a slow cooker. 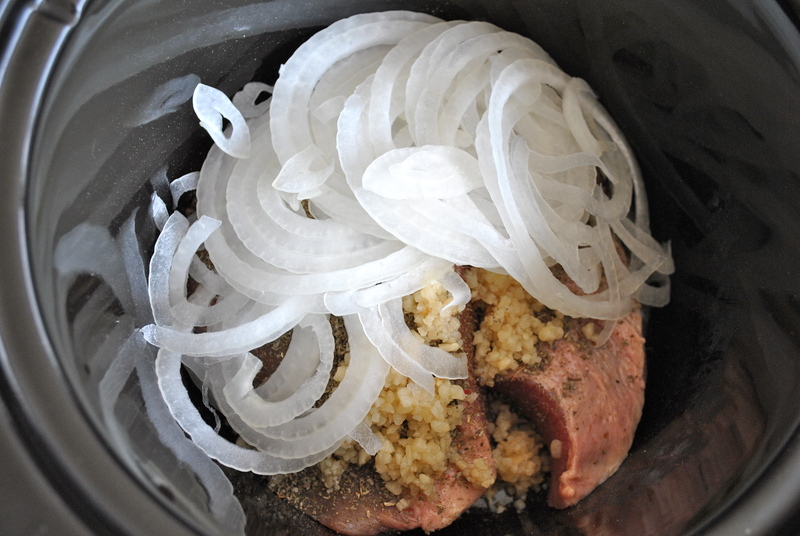 This entry was posted in Beef, Slow Cooker and tagged beef, brisket, food, recipe, slow cooker. Bookmark the permalink. very interesting….and I am assuming that you do your own photography…..wow…what a super job!!! keep them coming….kiddo….. Thank you! They are all my photos and hopefully, they’ll get better over time. I’ve needed a tripod forever and I think it’s time to get one! This looks very yummy. I want to come over for dinner! Saw a five pound brisket on sale at Sam’s yesterday and thought of you… did not buy it… way too big… but made me think of this post.